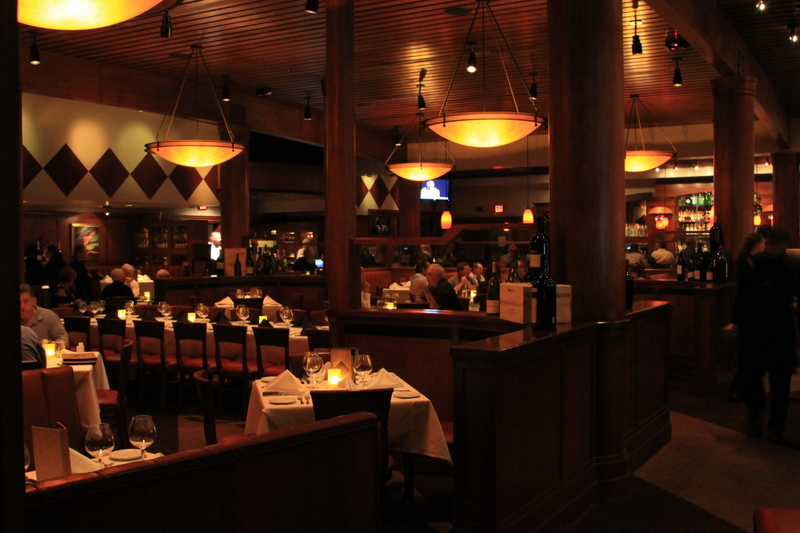 Last week Fleming’s Steakhouses across the country hosted their “Women & Wine” dinners. At the events guests were treated to some amazing wines made by some legendary women in the wine world including Cathy Corison, Kristin Belair and Janet Myers. We started out the evening with swiss cheese puffs and house cured salmon, citrus creme fraiche and crispy wonton. 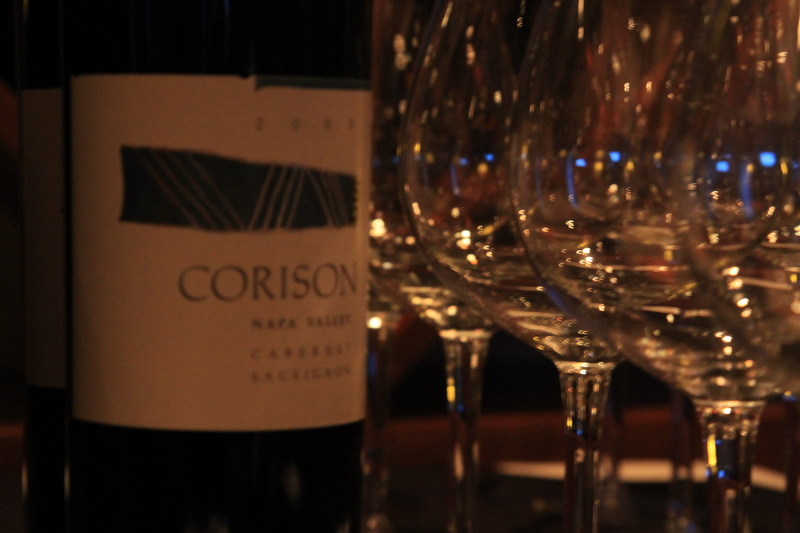 These were paired with Cathy Corison’s 2000 vintage Cabernet Sauvignon from Napa valley. Cathy Corison is a legendary wine maker having made wines for over 30 years for brands like Chappellet, Staglin Family, York Creek and Long Meadow Ranch. It was very nice to taste a wine that has had significant time to age in the bottle. This wine was very refined with beautiful and mature tannins. It paired very well with the food as it was soft and gentle enough as to not overpower the food. Next we enjoyed Butternut squash bisque with Danish blue cheese fondue and bacon herb bruschetta. This was paired with Honig, Cabernet Sauvignon 2006 Napa. 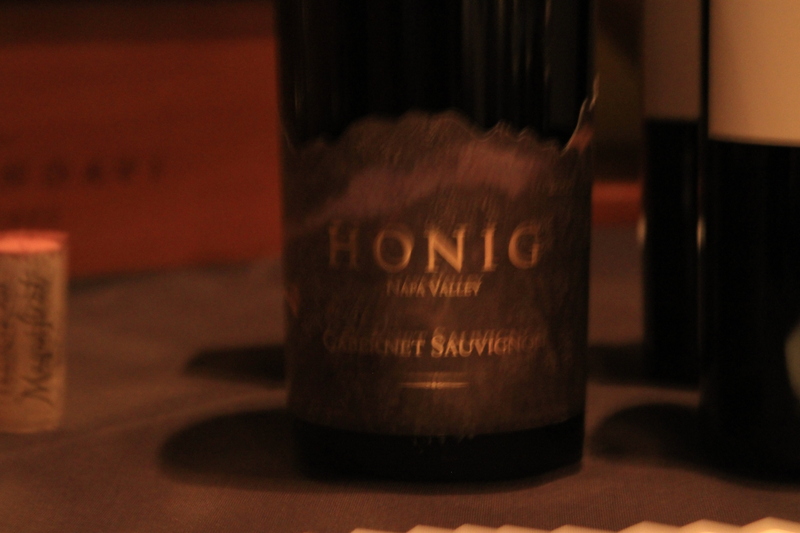 Kristin Belair is the wine maker at Honig and has been since 1998. This wine is much bigger and bolder, younger than the Corison. It displays notes of sage and currant as well as a pronounced creamy vanilla which only really came out after the Lamb chops served next. The wine manager for this Fleming’s location, Tony Novak suggested we save a little of the Honig to try later after the main course, to see how it changes with the main course. And it did. I thought it was delicious to begin with, but actually found it tasted better with the rosemary Lamb chops which is what we enjoyed next. Rosemary-scented lamb chops on parmesan risotto with maple roasted parsnips and a red wine demi glace. This was paired with Franciscan, Magnificat 2005 from Napa. This wine is made by Janet Myers who joined Franciscan Estate in 2003 and began winemaker in 2005. Janet is also the winemaker at Mount Veeder winery. 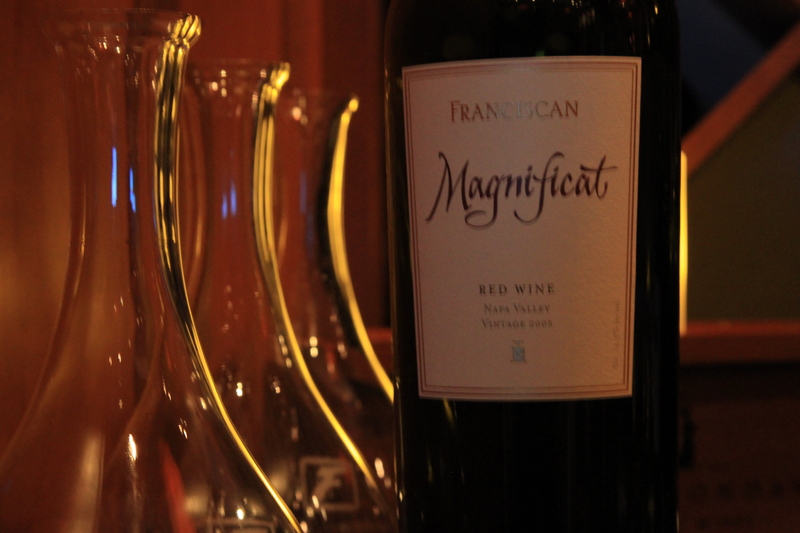 The ’05 Magnificat is a blend of 73% Cabernet, 23% Merlot, 2% Malbec, 1% Petit Verdot and 1% Cabernet Franc. This wine is loaded with dark fruit, powerful and a made for red meat! During the dinner we watched on a big flat screen some short videos made by Wine Spectator which gave us a little insight into the wine makers and the wines, including interviews and scenery. I thought that was a nice touch. My favorite part of the dinner came next: dessert! Thick and rich caramel pudding with crumbled Heath bar on top with shortbread cookies on the side. The dessert was pretty big and I was unable to finish it all, but I kept going back and nibbling on it, I couldn’t stop myself. At the end of dinner each table was presented with a special gift. A set of nice big red wine glasses with the Fleming’s “F” engraved on it and a bottle of the 2005 Magnificat. That was really an amazing touch because the wine alone retails for about $55 a bottle. Guests enjoyed an amazing meal, amazing wines, and then were given a whole bottle and two glasses for later…all for $95 a plate. It’s these extras that can really make a merely good evening into a great evening. *Disclaimer* I attended this event as a guest of Fleming’s and Tin Can Marketing.